Hi ya everyone! I am super excited to share this adorable image with you today from Tiddly Inks. All I want for Christmas is a Hippopotamus! Have you seen all the news regarding Fiona, the tiny (not so tiny) hippo at the Cincinnati Zoo? That's my hometown and when Christy the artist at Tiddly Inks drew this cutie I couldn't stand it. 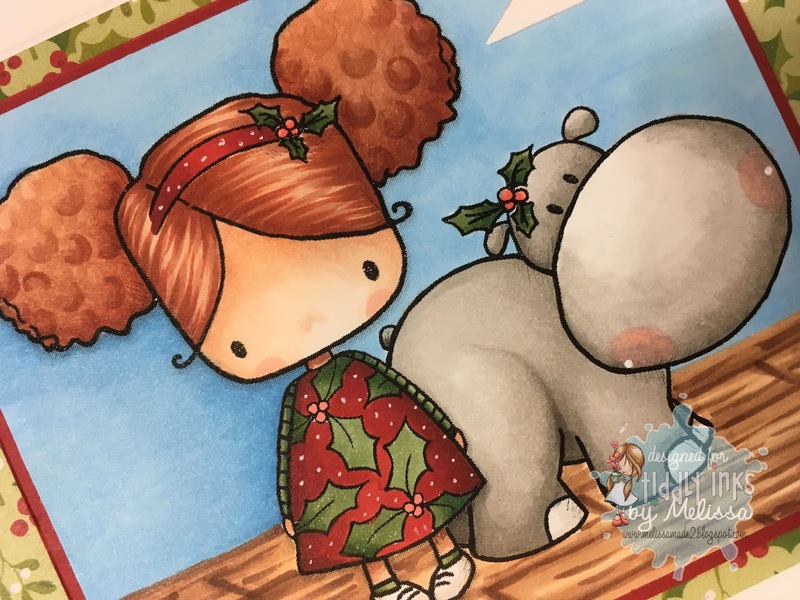 The digital image is called Holly's Hippo and can be found in the What's New section at Tiddly Inks! I colored these cuties in my Copics. I created a hardwood floor and blue wall to help the image pop. I layered them on some cute paper from Bella Blvd Santa Stops Here. I then stamped the holly jolly sentiment from Whimsy Stamps in Memento ink.